PUNE: It was a half Ironman that city-based entrepreneur Venkatesh Kashelikar completed in Dubai on February 2. 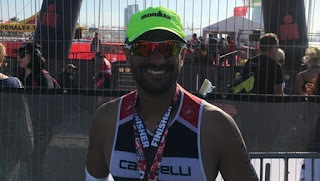 The circumstances leading to Kashelikar’s 8 hours and 43 seconds of sheer will and sporting endurance that covered a 1.9 km open water swim followed by a 90 km cycle ride and then, a 21.1 km run, might suggest the 43-year-old is already a full ‘ironman’; even before he attempts a full Ironman challenge in Germany later this year. One week before the race, Kashelikar was lying in a pool of blood in the bathroom. An attack of food poisoning rendered Kashelikar all about incapable of participating in the Dubai event. That is certainly what the doctors thought. For Kashelikar that was a death knell in terms of his preparations for the half ironman. He had already booked his flight and accommodation in Dubai, so he convinced his wife that he would just go there as a spectator only. “That wasn’t a lie, as I was not sure about my fitness. I had planned to just go there, cover as much distance I could and then retire,” Kashelikar says of him choosing to risk his well-being by taking on the endurance lung-buster. “I had missed crucial days of my training due to illness and injury, but as I started my event, I soon realised that my hard work was paying off. I comfortably completed the swim section ahead of my stipulated time. “I took more time changing gears during the cycling section of the event, as I wanted to be sure that I was doing fine. When the cycling also went smoothly, I finished the running with boosted morale. “Against all odds, in the worst physical state, I managed to pull through,” he adds, attributing his success to sheer will power. “I still can’t believe that I have achieved this,” says Kashelikar, a true ironman in every sense of the word. “However, I won’t advise everyone to do the same. It was my will power that carried me through and I was fortunate to finish without any issue,” Kashelikar added. Dr Surekh Nikam, who is also into endurance activities and long distance cycling warned that common man should avoid such decisions. “It was his decision and he had trained hard for the event. But overall it’s not advisable to participate in such strenuous activity unless you are totally fit. It’s not just fatal but might turn out to be dangerous in the long term. You can’t take everything for granted and you can always participate in the next event if you miss one,” he said.